Ah, good old Metroidvania game design, letting you glimpse new areas and riches but only letting you reach them once you’ve got a specific item. Shadow of the Tomb Raider absolutely loves to tease you with such things. And you may be surprised to finish the main story and still not have access to three different barriers. These are doors that require the Rope Ascender to pull down, barriers that need their ropes cut with the Reinforced Knife, and treasure chests that require a lockpick. So let’s get hold of those now, shall we? After that, there are four basic locations shown on your map for the outcasts. They’re not difficult to find once Lara’s in the circle, so check your map to make sure you’re in the circle and look for the NPC with a sidequest symbol above their head. You’ll need to not be wearing the Serpent Guard outfit, so once you’ve changed into something less scary at the nearest base camp, talk to each one in turn. 1. The first is literally in the middle of the green circle here, inside the building. He tells you the whereabouts of the white capybara, as a nice bonus. 2. Again, right in the middle of the green circle. From Lara’s location shown, the second outcast is up the steps and to the right. He tells you the location of gold. 3. You guessed it - smack bang in the middle of the circle here. This outcast tells you the location of the great condor. 4. The fourth outcast is here, and gives you the location of the fifth outcast. The fifth outcast is here, right in the middle of the green circle. She isn’t like the others - she’s a merchant. And it may take a few seconds to realise that she holds two of the most vital pieces of equipment in the entire game. So make sure you purchase the rope ascender and the lockpick next to it. Sweet. She gives you the quest to go and save her father, Hakan, who is being held prisoner. The sequence needed to rescue her father is simple - after speaking to the people around with cogs over their heads to make sure they’re ‘in’, you need to ask the ‘call to prayer’ horn blower to do so, then ask the musicians to stop playing, then - swiftly as the window is tight - ask the two men to help you open the door. The rest is easy, and the knife is yours. If you have the standard knife, this will give you the ability to break through the reinforced knife-locked doors, and if you already have the upgrade, it just means you take more resources from animals you skin. It also has the bonus of giving you a Crocodile Dundee-referencing achievement: 'That's a knife'. Nice touch." 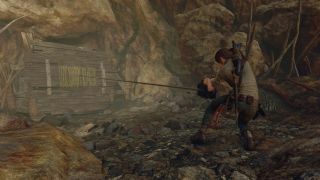 While you're here, why not check out our main Shadow of the Tomb Raider tips?